The Fifth Generation Mustang beginning with the 2005 Ford Mustang, brings in a fantastic new beginning for the venerable pony car. The underpinnings of a good sports car can mean the victory or defeat on the road and the same to the buying public. A pretty face only goes so far and while a good number of buyers will opt for the new Mustang, strictly on its looks, the dyed in the wool enthusiast will demand more. And with the fifth major model change for the iconic Ford Mustang, more they did get. Hau Thai-Tang, the chief engineer for the project spent his earlier career as a race engineer for the CART (Championship Auto Racing Teams) program. And that experience helped the 2005 Mustang gain its road legs. The new Mustang was made available in a fastback and convertible form, with a V8 powered GT option available for both body styles. Standard 4 wheel disc brakes,lightweight 17" alloy wheels and a taught suspension, even on the convertible models,gives a satisfying base to the new improved styling up top. The 2005 GT runs with a strong 4.6 liter V8 engine with 300 horsepower and bigger 18" wheels. 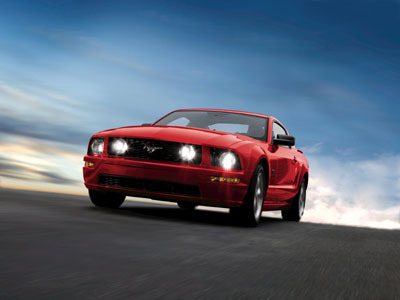 For more detailed information on the 2005 fifth generation Mustang, click here. 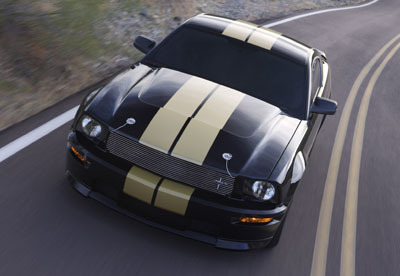 The Ford Mustang overall, was relatively unchanged for 2006. However a few new features appeared, that gathered a lot of interest from Mustang enthusiasts. The Pony package reappeared after an almost 40 year hiatus and Ford's V6 option was not only a thrifty fuel user, but provided enough grunt and revving abilities to win over many who previously thought V8 power was the only way to go. The Shelby GT350H Returns Ford and Shelby engineers once again recreated a modern version of the GT350H which was a for rental only special limited production car exclusively for Hertz. 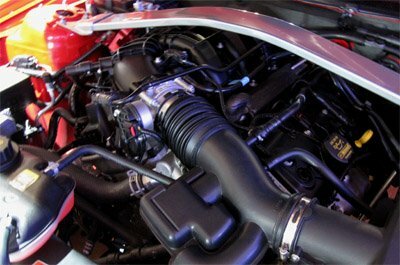 The new 2006 Mustang GT-H also brought back even more performance from the 4.6 liter modular engine. Check out complete information and specs on the 2006 model. The '07 model year was a carryover year, and as expected not a great deal changed, but a few cool changes of merit occurred. Probably the most important one, was the comeback of the California Special. Here's the new specs and changes on the 2007 Mustang. 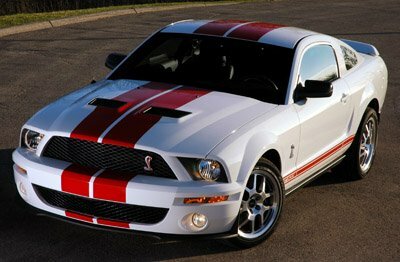 The other big news was the availability of the 2007 Ford Shelby GT500 with it's potent SVT (special vehicle team) 5.4 liter supercharged engine that produces over 500 horsepower. 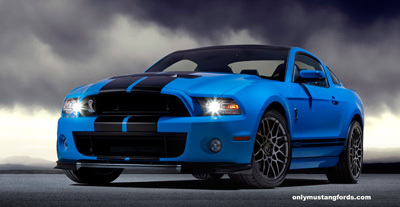 The other cool thing about 2007 was the introduction by Ford and Shelby American of the Shelby Gt500 Mustang Super Snake, a fire breathing beast with a modified 5.4 liter V8, pounding out more than 600 horsepower! For the 2008, fifth generation Mustang, it was about time for some important performance additions and resurrection. Ford jumped to fill the void just in time. The California Special continued to be available as an option to any GT package, but the big news for this model year, was the return of the Shelby GT and the GT500KR, arguably the most powerful Mustang that Ford has ever built. Check out these changes on the 2008 Mustang . 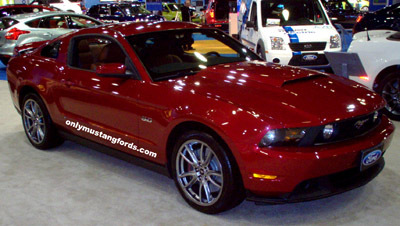 The 2009 Mustang continued its evolutionary styling and introduced some cool new features, including a panoramic roof. 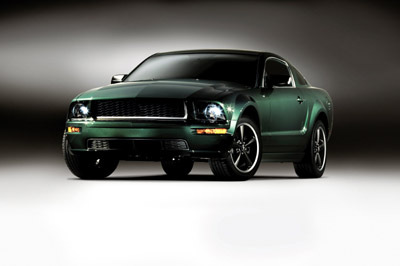 The Mustang Bullitt made a return, from 2001 with its Hyland Green exterior and performance refinements and made a lot of enthusiasts happy. The Bullitt upped the ante in the horsepower department from the already powerful 4.6 liter V8 engined GT, but the big guns really came out with the 540 horsepower GT500KR King of the Road. Check out all these changes and more for the 2009 Mustang here. The Fifth generation Mustang for 2010 incorporates some major interior and exterior styling changes as well as some important power increases. How well does the V6 pony car stack up against Chevy's V6 Camaro? Welcome to the 2010 Ford Mustang V6 vs 2010 Camaro V6 Shootout! 5.0 liter Coyote V8 . Not to be out shadowed, by the big V8 power, Ford has finally made the V6 option a performance car, with it's all new high tech 3.7 liter engine, pumping out 305 horsepower. That's 5 horsepower more, than the 4.6 liter V8 put out in the 2005 Mustang GT! The V6 pony car is also capable of sipping fuel at a rate of 31 mpg on the highway. That's the best gas mileage of any car in it's class. There's just too much to list here. 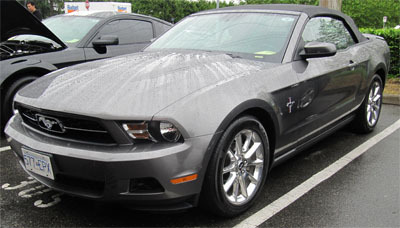 Check out the 2012 Ford Mustang sections above for lots more! The fifth generation of the world's favorite pony car continues with improvements and refinement everywhere. Get the full picture in the 2013 Mustang section , where we take an overall look at all the new models and changes, including the new 2013 Mustang GT, California Special and the ferocious new 2013 Boss 302. For an even more detailed account, check out the Ford 2013 Mustang GT section and 2013 Boss 302 sections, where you'll find lots of great pictures, specs and detailed information. 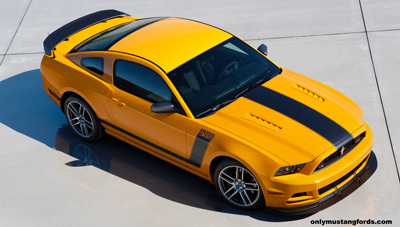 Would the 2013 model year be the last of the fifth generation Mustang ? That's what was on the mind of enthusiasts after the amazing array of new Mustangs for 2013. That was all laid to rest when the 2014 Mustang order guide was released. 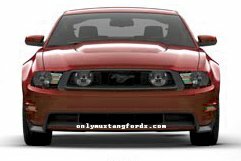 Ford will wait until the 2015 model year (which will debut in 2014) to unveil the new and substantially restyled, lighter and more modern looking new Mustang. Want to see if we were right? Here's the full story on the 2015 mustang S550 platform. And that's not even the biggest groundbreaking news! Rumors and discussion have gone on for years as to whether any future Ford Mustang would ever see another independent rear suspension. Purists insisted that no "real Mustang" would ever have an IRS, while others claimed that no matter how sophisticated the live axle pony cars ever got, they would still never reach their utmost capabilities or compete in the world arena without one. Guess who wins? Here's the result on the new 2015 Mustang rear suspension. But wait! There's more. And it's big news if you are a Mustang enthusiast in Australia. That's right for the 2015 model year, after decades of only grey market access, Ford of Australia will be featuring a brand new 2015 Mustang in Australia.